There's a new veggie burger in town. 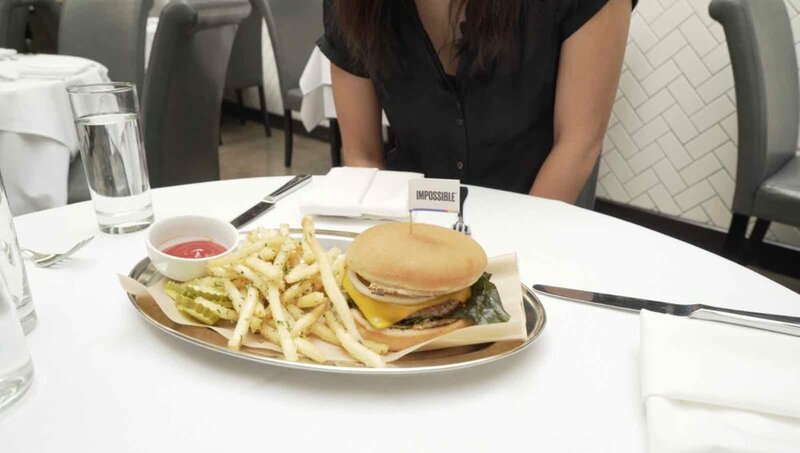 The Impossible Burger (from Impossible Foods) is made from plants but it tastes like meat. Or so they say. My vegan buddy Leslie Durso tried it at Momofuku Nishi while she was in New York City, which is how I first heard about it. I am a carnivore, married to a vegetarian. We desperately want to try it for ourselves. Lucky for us Angelenos, they're available at Crossroads Kitchen 10am-2pm, Monday through Friday. (You can also try it in San Francisco at Cookscomb and Jardiniere.) They usually sell out, though, so we arrive in the morning to film a burger breakfast video. The Crossroads Kitchen version has vegan cheese and sauce, pickles, tomato, and lettuce. They serve it with a side of truffle fries. The burger is the result of five years of intense research. They use natural ingredients like wheat, coconut oil, and potatoes - then add "heme" - short for leghemoglobin. This iron-containing molecule carries oxygen through the bloodstream, making animals' blood red. It is also found in plants, and Impossible Foods found a vegetarian way (using yeast) to produce it. I will tell you that the look, smell, texture and taste in the burger (as a whole) is eerily accurate. On its own, however, I can immediately tell it isn't meat. The craziest part? It makes me feel exactly like a fast food burger does - greasy and bloated for hours. My vegetarian husband likes it, but says he prefers more traditional veggie burgers. I agree - and will most likely be sticking to regular vegetarian or beef burgers as well. But it really is quite a scientific marvel, and if you get the chance to experience it yourself, you should.